At the end of the fall tryouts, seven players from last year’s 13U Black team and five new players were thrilled to be selected to form the 2013-14 Girls 14U Black team, soon to be named “Legacy”. The team was ready to work hard and strive for excellence under the distinguished leadership of Coach Kevin Hellyer, and Assistant Coach Kristi Moore, who helped lead the 13U Black team to a Silver Medal finish at the 13U Provincials last season. The tournament season started off with a bang at the Provincial Cup tournament where Legacy played in Cobourg in the Trillium H division on November 16th. Putting on an impressive demonstration of jump serving and great teamwork, Legacy swept through all three pool play matches in two sets straight. Despite losing a key player to injury in the last game of pool play (who showed her dedication to the team by insisting on staying on the bench with the team for the rest of the tournament rather than go to the hospital! ), Legacy pulled together and continued their run of success, winning in two sets in both the quarter and semi-final matches. The Gold Medal game against STVC was a greater challenge, with some uncharacteristic errors and tense moments, but the team fought hard to the end of the third set and emerged victorious with a Gold Medal – a great way to start the season! 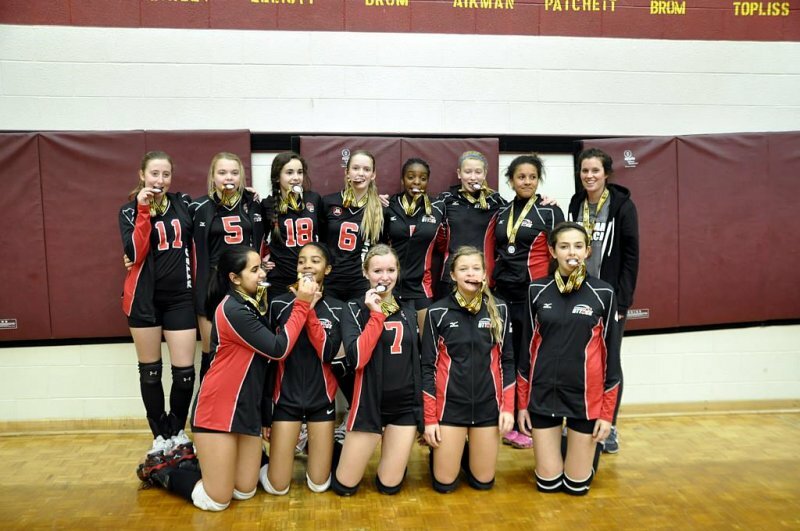 The second tournament of the season was the 15U Provincial Cup on November 23rd, where Legacy found themselves seeded in Championship East division (at Queen’s University in Kingston) against some fierce competition (including DA 15U Black and Red!). Legacy struggled to find their rhythm and play to their potential against their more senior opponents, giving up the first match to DRVC, started to show what they can do winning vs. Markham Stingers, but then losing the third and fourth games to Leaside and Durham Attack 15U Red, ending in a tie for 7th place. Although the day did not go as well as they hoped, the team had a great team-building experience at their first overnight out of town tournament, and emerged focused on working even harder and determined to show what they can really do going forward. The final tournament of 2013 was the 14U Challenge Cup in Newmarket on December 7th. The day started well with strong and consistent serving, fierce power at the net, and pulling ahead in the second half of the sets to secure the win, winning the three pool play games against Northern Chill, Georgian Cubs, and Ottawa Fusion. The fourth game was vs. STVC Tektonics, who were the nemesis of DA 13U Black all last season. After an exciting win in the first set 25-18, STVC pulled ahead in the second set to win 25-21, and in the end took the third set as well to win the match. Legacy moved on to the Bronze medal game vs. Aurora Storm Twister, and made it count, winning in two sets 25-21 and 25-12, earning a Bronze medal to add to their collection. Two medals in three tournaments – not a bad start, but a record the team is determined to better in the new year! Sadly, the team then faced a challenge no team wishes to have to experience. On December 16th, we tragically lost a beloved member of our volleyball family, Brian Van Camp, the father of our team captain Kate, and one of our most knowledgeable and enthusiastic parent-fans. Team Legacy came together immediately to provide support and caring to Kate and her family, and decided to go ahead with a fundraising event at Boston Pizza that had already been planned that week, but changing the purpose of the event to provide support to the Van Camp family. The Durham Attack community as a whole showed huge heart, packing the restaurant and making donations in tribute to Brian. Team Legacy attended the Celebration of Life for Brian in their team tracksuits, being there as a unit to support their teammate and her family at this very difficult time. Moments like this remind us of the true value of sport in our lives… not just winning medals, but the community of special people we are fortunate to get to know, who become our extended family with whom we share and support each other through both good experiences and tough times, and who have positive influence on our lives… like Brian and the Van Camp family have done for so many – as was apparent by the extraordinary number of people who packed into both Boston Pizza and the Blackstock Community Centre for the celebration of his life.